Animal farm is the place for raising animals, which is normative in production and is high-quality raising. The scientific and reasonable growth environment is beneficial to the breeding of animals, production and management of the farm. This farm managed by wireless data technicians, it increases the quality of animal production, improves the management level, decreases the investment cost. Intergate and using all sources to make the management of the farm become informatization and intelligence. ·Long range between the monitoring center and each farm, terrain environment is complicated, unable to install wired connection. ·There is jungle between every farm and it’s the obstacle in the project. Because of the complicated environment, it is easy to cause the short circuit in the wired option. 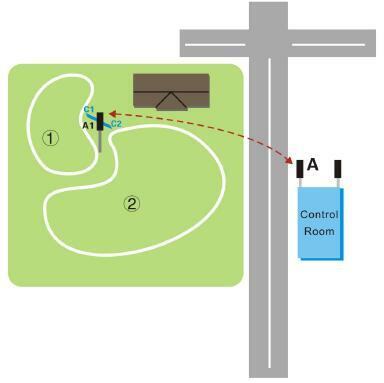 ·There is an expressway between the monitoring center and farms, unable to install wired connection, only available for wireless transmission device. ·There is one 1080P camera in each farm. the bandwidth is around 3–4M. ·Make ensure all cameras can operate stably in a long term, and all videos should be clear and stable. ·Make ensure the security and safety of videos. This farm is 2000m’.We set the monitoring center at Point A1，and set cameras at Point C1&C2 for wireless monitoring Therefore PointAtoA1 becomethe wireless link. Even though there is an expressway between the monitoring center and farms, it is line of sight in this range and it can use point to point for wireless monitoring system. This farm is in operation, it will ruin the raising environment of animals if installing wired system. We are using DIP356一H in this project. This item is 5.8GHz with large bandwidth. It ensures the picture definition and stable transmission. The item is specialized for outdoor. Housing material and internal hardware are both met the requirement of outdoor using, good choice for extreme weather. This wireless monitoring project is easy setting, removable and support high speed movement. It can increase or decrease the number of monitoring points, or change the location of monitoring, even the vehicle in the high speed movement can also be the removable monitoring points. ·Low cost: use wireless network can save the cost of cable, the rent of leased line and the related cost when the device needs to be moved. ·Flexible: wireless access point has a highly flexible on extend, because it is without the limit of cable. User are easy to setting the new monitoring point without affecting the origin monitoring system when expanding business of the farm. ·Removable: wireless network allows the user access network in anytime, anyplace. No need to specify an explicit access point, therefore user can surf the Internet as they need. ·Quick install: Very easy to install wireless network, no need builder’s license in installing cable or digging groove. ·Convenient on capacity expansion: It only needs to bring the wireless access point to new location and install if more monitoring points needed in the future, no need to re-install as wired devices. ·Easy on maintenance: Wireless network is easy in maintenance, reducing workload of workers and improving their work efficiency.